﻿ 2 Peter 1:21 for no prophecy was ever made by an act of human will, but men moved by the Holy Spirit spoke from God. For no prophecy was ever brought by a will of man, but holy men of God spoke, being led by Holy Spirit. For no prophecy ever originated because some man willed it [to do so -- "it never came by human impulse], but men spoke from God who were borne along (moved and impelled) by the Holy Spirit. For prophecy was never produced by the will of man, but people spoke from God, as they were carried along [i.e., inspired] by the Holy Spirit. 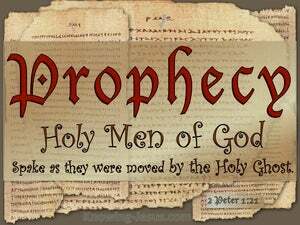 for the prophecy came not at any time by the will of man, but holy men of God spoke as they were moved by the Holy Spirit. for no prophecy was ever made by the act of human will, but men moved by the Holy Spirit spoke from God. from the prophet's OWN MOTION; but the holy men of God spoke by the IMPULSE of the holy spirit. for prophecy was not ever uttered by the will of man, but holy men of God spake under the power of the Holy Spirit. but the holy men of God spoke, being moved by the Holy Spirit. 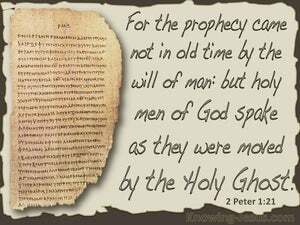 For in the olden time prophecy did not come by the will of man: but men moved by the Holy Ghost spoke from God. for no prophecy ever originated in the human will, but under the influence of the holy Spirit men spoke for God. For prophecy never came by the will of man, but the holy men of God spake being moved by the Holy Ghost. For prophecy was not once brought by the will of man: but holy men of God spake, being moved by the Holy Spirit. For prophecy was not borne at any time by the will of man, but holy men of God spoke being borne along by the Holy Spirit. 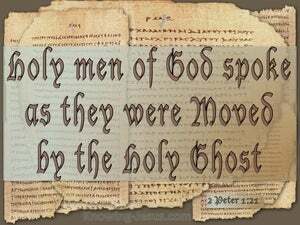 For the scripture came never by the will of man: but holy men of God spake as they were moved by the holy ghost. for prophecy never came by human impulse, it was when carried away by the holy Spirit that the holy men of God spoke. For no prophecy was ever brought by the will of man; but moved by the Holy Spirit, men spoke for God. For no prophecy ever came by the will of man: but men spoke from God, being moved by the Holy Spirit. For prophecy never came by the will of man; but moved by the Holy Spirit, men spoke from God. For not, by will of man, was prophecy brought in, at any time, but, as, by Holy Spirit, they were borne along, spake, men, from God. For prophecy in old time came not by the will of man: but the holy men of God spake under the impulse of the Holy Ghost. for no prophetic teaching ever came in the old days at the mere wish of man, but men, moved by the Holy Spirit, spoke direct from God. for no prophecy has ever yet originated in man's will, but men who were led by the Holy Spirit spoke from God. for prophecy was never brought by the will of man, but men spake from God, being moved by the Holy Spirit. 20 But know this first of all, that no prophecy of Scripture is a matter of one's own interpretation, 21 for no prophecy was ever made by an act of human will, but men moved by the Holy Spirit spoke from God. Then the sons of Judah drew near to Joshua in Gilgal, and Caleb the son of Jephunneh the Kenizzite said to him, "You know the word which the LORD spoke to Moses the man of God concerning you and me in Kadesh-barnea.